...that the Scorn can use Dark Ether to resurrect themselves? "The ground upon which you walk shall burn. YOU shall burn." 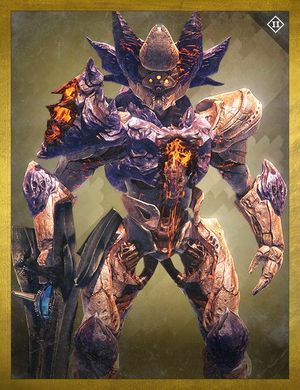 Urrox, Flame Prince, also known as the "Scion of Oryx", is a Hive Knight found in the Prison of Elders. Urrox held watch over an ancient brood that has long since vanished. He has a special ability where if he stamps the ground, the floor will cause solar damage to Guardians for ten seconds. Upon entering the arena, head straight to the left and into the back corner. Here you will conduct the entire fight. One guardian should be watching each side of the small area to quickly dispatch any and all lower level Hive. The third guardian may choose to run between the sides and help the other two until there is enough time to deal damage to Urrox. Recommended weapons would be ascended Black Hammer and Gjallarhorn due to their abilities to deal solar damage. Black Hammer's Precision Mag Bonus perk is invaluable during this fight as it eliminates the need to risk running out and acquiring ammunition drops. Hive Wizards and Knights should be dealt with swiftly along with the Thralls as these enemies are more likely to rush your party. It should be noted that when he enables his "Searing Flames" debuff against the guardians, you will only suffer damage if you are touching the floor. An effective strategy is to have a Titan place a shield which grants Blessing of Light and to use jump perks which can keep you in the air for larger amounts of time. Patience is key in this fight and Urrox should only be damaged when it is safe enough to do so using the above mentioned weapons.